Beauty Beneath the Dirt – Official Trailer from Jason Furrer on Vimeo. Let me introduce to you three people that Chris and I met in 2010 on the Appalachian Trail during our thru-hike. Ringleader (Kate), Monkey (Brandon), and Lightning (Emily). While for the most part we only hiked around this group not with them or necessarily hanging out with them, I knew we would still want to see this documentary they made while hiking in 2010. There was a bit of controversy surrounding them, particularly in the beginning of the trail, in regards to their filming and that is touched on a bit in the movie (I think in the extras) with Monkey telling the naysayers to bleep off. I think as time went on it was just known that they were The Traveling Circus (for short The Circus) and that was that and I feel that at least the hikers that knew them/of them the contentiousness was dropped to some extent as time went on, at least from my perspective. I’d heard a vaguely of The Circus sometime when we were just getting into North Carolina, but even after meeting Lightning as she came out of nowhere on Wayah Bald one day, we didn’t really understand who or what the group was for many more miles. Lightning, she’d puff smokes and still be this crazy fast hiker that I wouldn’t dream of being able to keep up with. It may have been Damascus, Virginia before we saw the other two members of The Circus. I remember Ringleader asking the folks at the Mt. Rogers Outfitters something in regards to her down jacket as bits of down were coming out, but that was really it. I think we leap-frogged around them between Damascus and Atkins where we saw them a few times during our nearo in Atkins. I believe all of us left Atkins the same morning and that was the first time we really hiked around them for any length of time. I remember Ringleader taking her camera out several times to film the pastures the trail went through in that area, and chatting with them a little at a few shelters during breaks. Somehow I recall them pulling a 20+ miler in order to get somewhere to meet friends. At that time 20+ miles seemed like a far fetched dream! And after that day I don’t remember really seeing them all that much as it wasn’t but a week later that we got off the trail to return home for my niece’s funeral. When we returned to the AT after the funeral Trail Days was going on and Lightning was down there while Ringleader and Monkey were at Ringleader’s law school graduation. We gained some days ahead of them and I think the next time we saw them was sometime in Pennsylvania—definitely on the day we stayed under the bridge the day it rained—they came through dripping wet on a slack pack but were headed to a hotel or someones house, lucky them! For the next while they were around for awhile. I recall a very interesting encounter with them in New Jersey as they were recuperating from a night in town. Their recuperation was occurring in the middle of the trail as they slept off their drinks from the night before (don’t worry, no photos y’all!). Later on we actually got to talk to them a bit at the RPH Shelter in New York, which is where Chris took the photo of Ringleader that is on the spine of the DVD. I don’t know when it was that we last saw them as somehow we ended up in front of them by the time we finished the trail. The three of them, though split up at that time, finished a few days after us in August. Then of course comes Facebook and social media and the ability to be ‘friends’ through those avenues so it has been nice to actually get to know Ringleader a little bit more than I did on the trail. I admit, I was a bit skeptical as to if the movie would come to fruition. Kate/Ringleader went on to be a lawyer, Monkey went to med school and I’m not sure what Lightning is up to, but I’m sure she’s living her life too. And then last year the movie came out. They started off by doing some showings in Chicago and a few areas where they lived and then Monkey and Ringleader did showings up and down the AT in various towns, festivals, and hostels. I didn’t really have many people to ask to find out what it was like but what I heard was negative; apparently there was a lot of cussing. Ooook. But then I also saw good reviews from AT hikers on the trail last year who wrote about it on their blog so I began to really wonder and knew that seeing it for myself was really the way to go. And? Yes, there were many f-bombs but you know what? Half of them had me and Chris laughing our heads off, particularly the ones coming from Monkey when he went off in a confessional about group infighting. And some of the f-bombs were just courtesy of the moments on the trail. I mean, I had my moments. There were a string of curse words coming from my mouth when I slipped on a wood plank in Vermont. You are living, eating, breathing the trail and then little crap moments happen and it seems the world is ending. But then again, I’m not really averse to cussing when used properly. Would the movie have had the effect it did without the cussing or if Monkey had said something more gentle instead? Probably not. Not only that, substituting something else just wouldn’t have been them and would instead of have been a farce. Which brings me to why I think some people might have had a problem with the movie. This isn’t a shiny, sparkly movie about the Appalachian Trail (don’t get me wrong, there are beautiful shots in the movie!). Instead, it’s a movie about three people who hiked the trail and their experiences. Every single person who hikes out there comes to the trail with a different background and story, their dynamic and story along the trail evolves differently due to their experiences, and they emerge at the end someone different (maybe) than everyone else. In the extras (which I haven’t finished all the way yet) Ringleader talks with the other producer and editor of the movie about what the focus was of the film. They had captured hours upon hours of the hike on film and when they went to review they had to come up with a story. Along the way they did interviews of some of the other hikers and I know they shot scenes in so many other areas but they had to figure out what was going to make a movie. Their answer was ‘group dynamic’. And it was so true. The three of them with different backgrounds, despite two of them being related, all coming to the trail for different reasons, and their interactions along the trail is what made the story. I won’t give away much but we had heard that The Circus had broken up somewhere in Maine. That story is told in the movie. I will say, I think part of the problems that came up could have been resolved pre-hike or within the first few weeks. Ringleader mentioned multiple times feeling like she was never hiking with Lightning. I saw this same thing happen with others hiking as couples and even with us on our second day on the trail. The whole fastest person in front thing does not work especially if the slowest person in the group is unhappy about it. We worked it out that I hiked in front consistently except for a couple of times when Chris had a blister or had hurt his ankle (snow in the Smokeys) and that’s pretty much how we hike now unless we’re dayhiking and doing something leisurely. Communication is very much key when hiking or backpacking with a group. If some kind of resolution had been solved early on then maybe the problems The Circus faced would have been resolved—-but then maybe there wouldn’t have been the movie that we saw either! In all, I think this movie should be in any collection for the Appalachian Trail. 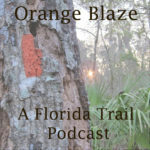 It is one story among thousands from the trail and I think worth watching especially for anyone who hiked in 2010 as you may see familiar faces. If you don’t want to buy the DVD, at least rent it online for a night and watch it. It is a great movie, not worth the criticism I’ve heard in my opinion, and is well made for what equipment they were using and the fact they were doing it themselves. If you want to watch something different and not your standard RedBox fare, check it out. There’s one moment with Lightning stirring a pot of something over her stove, a beautiful sunset in the background and she’s lamenting that she really wants a cheeseburger. I totally understand. Great review- appreciate how you spell out the angle of the movie– that it is about the group dynamics. So many of the hiking movies are about the personal transformation, so that would make this one worth checking out. Well said! I was one of the naysayers. I think partly because I was surprised by the content. I definitely thought it was well made, but I just had such a different experience than they had on the trail and it saddened me a little bit. Plus the swearing was a little unnecessary for me.